James “Jim” Brown passed away on Saturday, July 1, 2017 at the age of 99 after a long and fulfilling life. He was born in Spartanburg, South Carolina to George Thomas and Ruth Kathleen Brown on November 16, 1917. Jim proudly served his country as a First Lieutenant in the United States Army, 90th Infantry Division, during WWII. Among other medals, Jim was awarded The Bronze Star Medal for meritorious achievement in active ground combat on the front lines in Germany in 1944. Jim was also awarded The Purple Heart after being severely wounded in action near the Saar River, losing his left arm and two fingers on his right hand. Upon returning from the war, Jim married the love of his life, “Boosh,” on March 14, 1945, and they remained devoted to each throughout their marriage of over 72 years. Despite his disability, Jim loved to play tennis, became an avid golfer, and was affectionately referred to as the “one-armed bandit” by his golfing buddies. 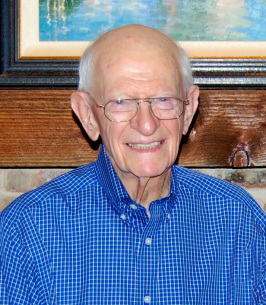 Jim was a longtime Rotarian and former President of Irving Rotary Club, lifelong member of Las Colinas Country Club, and active member of First United Methodist Church in Irving. Jim openly professed his faith in his Lord and Savior, Jesus Christ. He was a man of exceptional character and was treasured by all who knew him. Jim was a loving husband, father, grandfather (“Pops”), great grandfather, brother, and friend to many. Jim is preceded in death by his parents, sister Catherine Elizabeth, and brothers Edward Dean and George Melton Brown. Left to cherish his memory are his wife Emma Ruth “Boosh” Brown; daughter Carol Lynn Brown; son James Marvin Brown, Jr. and wife Christy; son Robert Dean Brown; grandchildren James, Kathy, Alex, Nicole, Daniel, and Adrienne; great grandchildren Robyn and Jayden, along with numerous extended family and lifelong friends. A funeral service will be held at 11:00 am on Friday, July 7, 2017 at First United Methodist Church, 211 West 3rd St., Irving, Texas with interment at Oaklawn Cemetery in Decatur, Texas at 2:30 pm. A visitation will be held between 6:00 and 8:00 pm on Thursday, July 6, 2017 at Brown’s Memorial Funeral Home in Irving. To send flowers to the family of James "Jim" Brown, please visit our Heartfelt Sympathies Store.